Farewells, Flying And Friends – Run. Ride. Roam. “*&#@! ** roundabouts!!! !” shouted Steve. Well, he had to throw one final round of abuse at his old traffic nemesis, as we navigated our way through the outer London streets. The roundabouts sure were doozies. They were double and triple wammies, a bit like driving through the Olympic rings. We would no sooner have gone through one loop, when another one was connected to the first one and we were roundabouting and looping and dodging traffic through another one. The English roads were giving Steve a final farewell! The day had come to take flight. The day we would wing our way away from England and away from our European adventure. 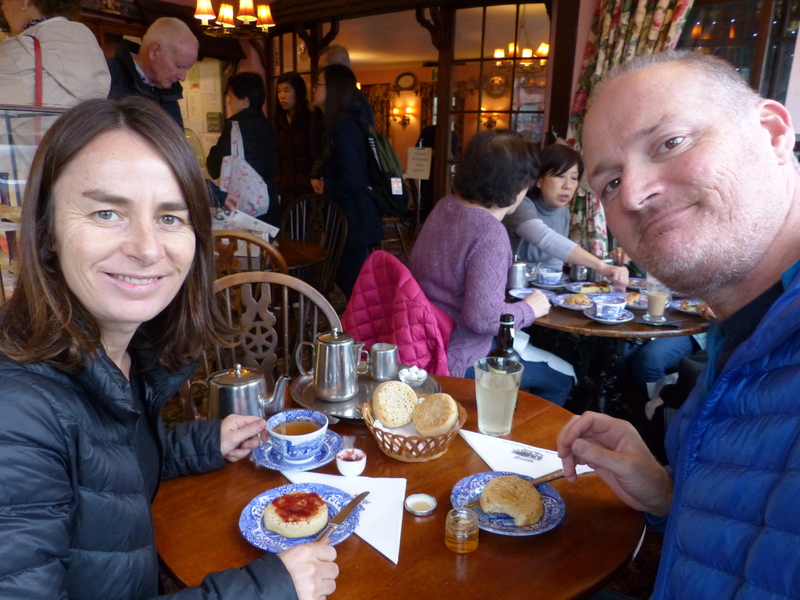 We could still fit in just one final English experience though, so we headed for Richmond, where we sat and had tea and crumpets in a historic tea room. The tea room is named after Maid of Honour cakes and it’s believed that Henry VIII came across Anne Boleyn and her Maids of Honour eating the cakes from a silver dish. Tasting one for himself, the King was so delighted by its ‘melt-in-the-mouth’ sensation that he confiscated the recipe and demanded it be kept secret in a locked iron box at Richmond Palace. 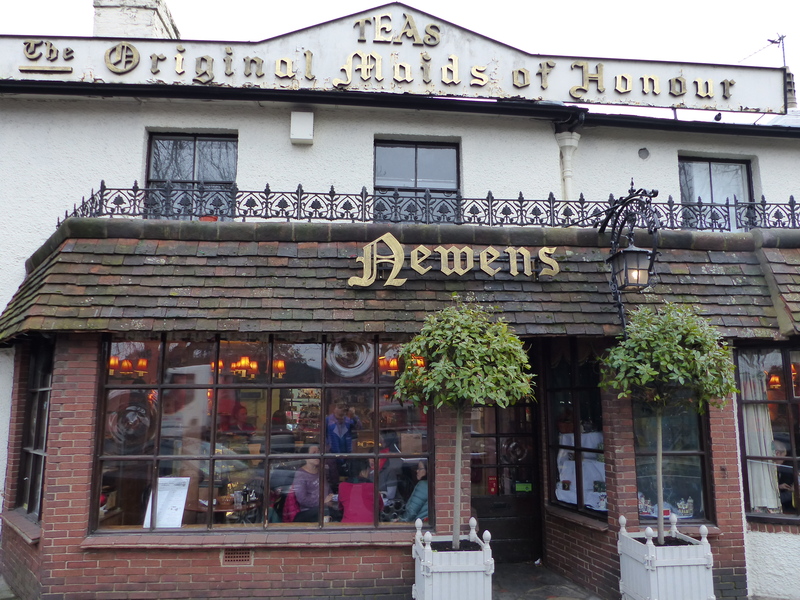 Well it must have surfaced again because by the 18th century, the recipe had found its way to a bakery in Richmond and the first Maids of Honour shop was opened. After our final British tea room experience, we headed for a National Trust property, where we sat, looking at fields and had some lunch before heading to Heathrow. 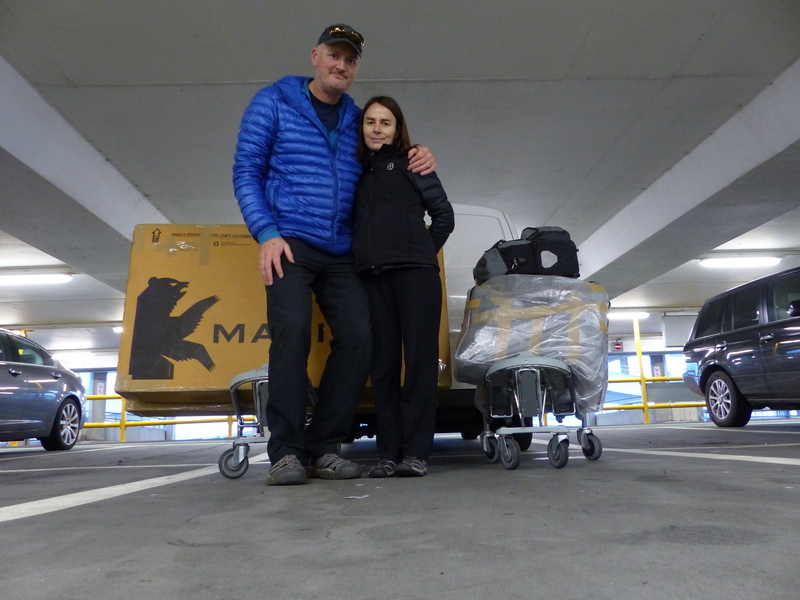 We sealed and labelled the bikes, loaded up the trollies and made our way to the terminal. Ready to see if we pass check-in! To our surprise, we went through check-in with no excess baggage fees and then it was just a case of waiting it out until our flight was ready to board. We sat and watched the departure screens, looking at the names of places and chorusing together, “Been there…been there…been there…New York, been there…Philadelphia, been there…Lisbon, been there…haven’t been there…haven’t been there…” There were still a lot of places to go! Our flight was delayed and the announcement in the departure lounge apologised, explaining it was due to the late arrival of the previous flight which had been held up due to “operational problems.” Now I, not being a member of “team relaxed” when it comes to flying and instead being a card carrying member of the “white knuckle brigade” immediately began conjuring scenarios of what “operational problems” could mean. Then… we finally got on board and the voice came over the PA from the flight deck. You know what it’s like, you’re on the plane, it’s busy, people are boarding and the PA system isn’t very loud or clear and you just catch words here and there of the announcement. Well, the words I grabbed from the voice from the flight deck were “technical fault” and “engine”. Hang on a minute!! Come on mate!! Those are three words we don’t want to hear spoken together when we are on a plane! News Flash…You keep that information to yourself! So of course, I was then worrying about an engine falling off, dying or generally technically faulting while we were thousands of feet in the air! Then…just as I was churning the mental cogs over those scenarios, another eventful little moment occurred. A couple with two babies had boarded and weren’t happy with their seats. They were shouting and wanted to be moved. This went on for quite some time and as we were already an hour late, I was beginning to worry we were never going to leave. Eventually, whatever was said must have placated them enough, because the doors were shut and we took off. Then…about 90 minutes before landing, I saw one of the cabin crew go running past us down the aisle. Not walking briskly, actually running. Then another one went running down the aisle. Then they came running back carrying fire extinguishers! I turned around and the entire cabin crew were huddled in a big group around the toilets, with fire extinguishers in hand. My knuckles were getting even whiter and my stomach lurched just a little! What on earth was going on! Is there a fire on board!? The problem was eventually sorted and calm returned to the cabin, although a girl behind me was in tears. Note to Emirates cabin crew…you do not run down the aisle of the plane! By all means, run around carrying fire extinguishers if you want to create panic and alarm amongst passengers, but if you want to maintain calm, please just walk and maintain an air of brisk efficiency and calm! Do not look panicked yourselves, lest this permeate the cabin! I didn’t want to think how they would react in an actual crisis or emergency. Would they shout at all of us to run!? This little event did not make it look as if they would be calm in a crisis themselves. Then…we were just landing, when that voice from the cockpit came on again, thanking us for flying with Emirates and if we were staying in Dubai… “We hope you enjoy your stay. If you are flying on, we hope you have a safe journey.” Hang on a minute! I don’t want you wishing me a safe flight! There’s nothing I can do about the safety of the flight! You fly the planes mate, you’re supposed to make it sound as if safety is a given! By all means wish us a “pleasant” flight, or an “enjoyable” flight, but please don’t make me think I have to “wish” for a safe flight, as if there’s a possibility of it not being a safe one! Honestly flight deck crew, you need to lift your game with your announcements, your PR and what you choose to say to your passengers! Then…we were late arriving, due to our delayed departure, so we were met at the gate by an Emirates man, who escorted us and another couple who were catching the Kuala Lumpur flight, through the terminal…power walk, power walk…through security…rush, rush…onto the train, zoom, zip…through the next terminal…to the departure gate of our next flight. We made it. However, despite them knowing our flight had been delayed and knowing we were coming, they had given our seats away, the seats we had booked with the extra leg room for Steve and reissued us with new boarding passes and new seats, with cramped space for Steve. After we took off, we asked about leg room and the nice flight attendant put us in an exit row, so at least Steve could stretch out. After that the flight was pretty smooth and the landing was good and we were in Malaysia and in Kuala Lumpur! We went through Immigration Control. I should say, we breezed through Immigration, no questions, no problems, just straight through. Then…we headed to the baggage collection area and waited for our bags to appear on the belt. The bikes arrived and were sitting on a trolley waiting for us. This was a good sign! The bikes were with us. Waiting for the bags…waiting for the bags…no bags…still no bags. Darn! It seemed we’d made the tight connection and the bikes made it, but the bags hadn’t and were somewhere still in transit. Off we go to baggage claim, leave our details and hope they get delivered before we leave Malaysia! We just had Customs to get through now. It turned out to be the the easiest Customs experience we’d ever had. We were greeted by the customs officer. That was it! As easy peasy as that! By that stage we were needing a dose of “easy”! So, after three hours in the airport, we finally made it to our nice and very friendly hotel, rolled into bed at midnight, after two days in transit. That was some eventful transiting too! Steve’s first word as we left the airport and walked outside were, “Aaaaaahhhhh.” He’d felt the heat! The day had arrived, to travel into Kuala Lumpur and meet my friend Sweeny. I met Sweeny online a couple of years ago, with us both being members of the same running group. 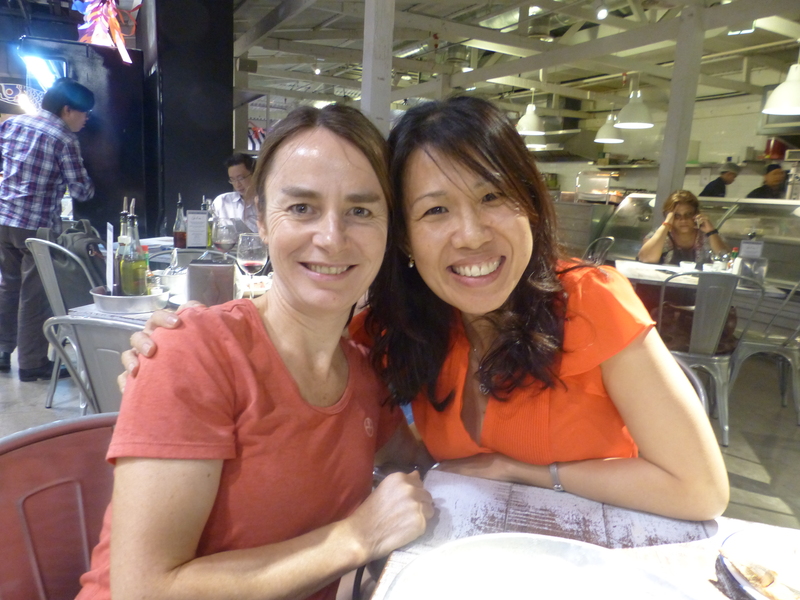 We began emailing and keeping in touch and chatting about all sorts of things, so when the opportunity came to swing by Malaysia on our way home, I had to grab the chance to meet face to face. We left our information with the hotel, informing them that three stray bags would be delivered by Emirates in our absence and could they hold them until our return the following day, then we took a taxi with a very friendly taxi driver and zipped our way towards KL. I was just hoping upon hope, that those bags would arrive and get delivered and we would again be one complete travelling unit! 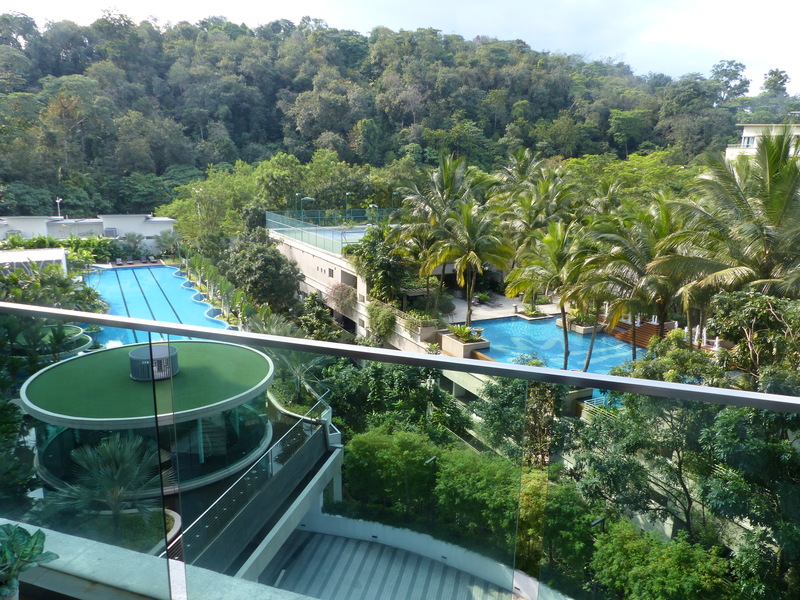 As we sped along the highway, I was immediately struck by the beauty of KL and all the green and trees and open spaces. It was a very scenic drive. We found Sweeny’s apartment, which she shares with her husband Sasi and son Jordan and it was absolutely wonderful to finally meet her and see this lovely person who I’d got to know through the written word, over a couple of years. 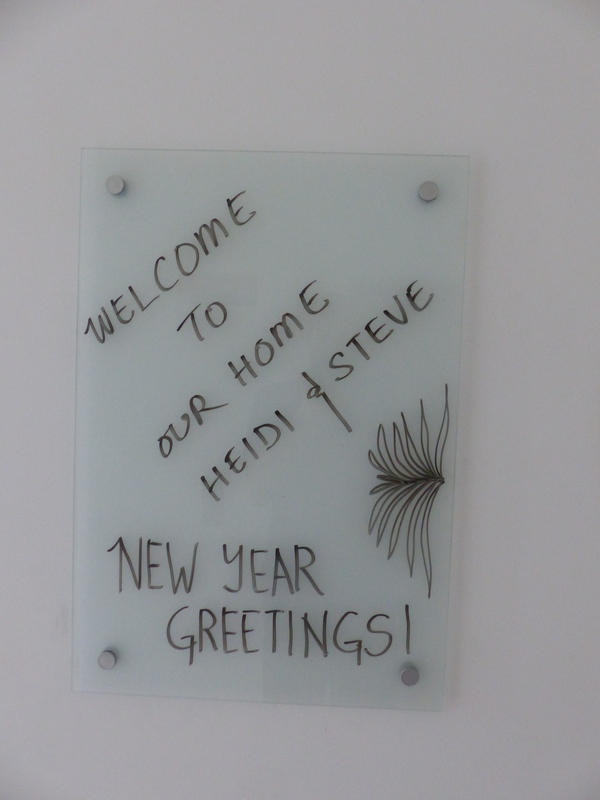 She even had a greeting written beside the door, for our arrival. Sweeny had kindly booked Steve and I in for a two hour massage with her massage therapists, so we took off straight away, to prepare ourselves to be rubbed, kneaded and have some knots and kinks ironed out. We got the hot rock treatment and some good firm working over of our muscles and after our tiring time in airports and planes, I think we might have both had a bit of a snooze on the massage table! 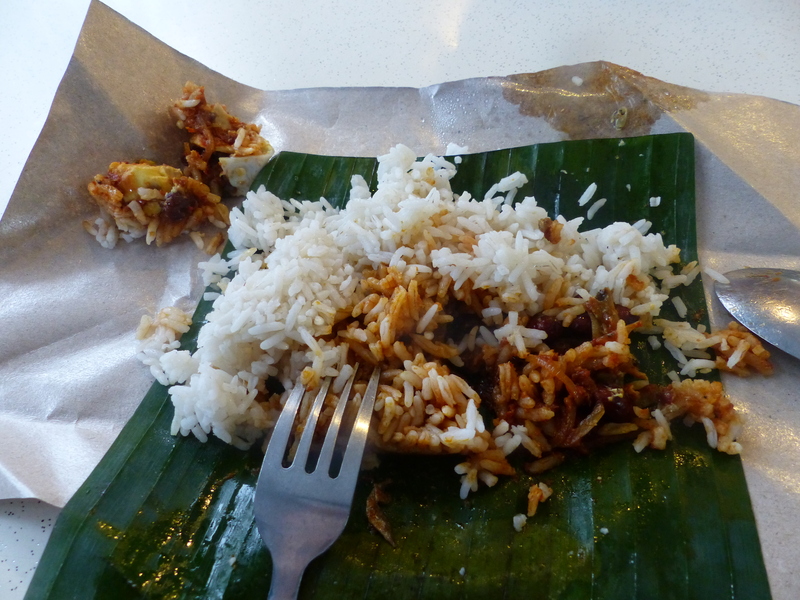 When Sweeny picked us up, it was time for lunch, so we headed down the street to a small, outdoor cafe to have our first banana leaf meal. 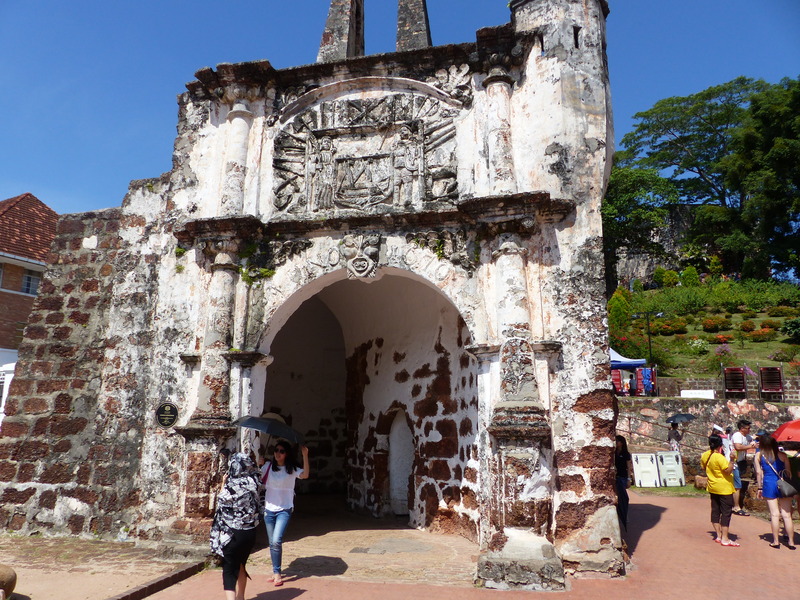 Malaysia is such a wonderful melting pot of cultures, being made up of Malays, Indian and Chinese and these influences are all around, and particularly in the food. Our banana leaf lunch was Indian and was delicious! 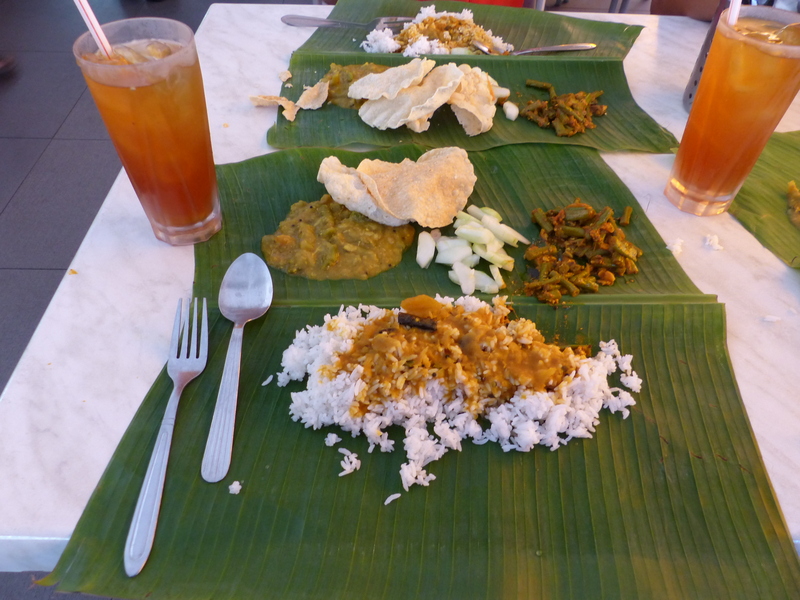 Food is served on a large banana leaf, with selections brought out and placed on the leaf by the waiter. As new dishes are prepared in the kitchen, they are brought out for us to try. Sweeny was wonderful, as she spoke to the waiter and asked questions for us, to ensure the dishes were vegan and we enjoyed this amazing and tasty selection of local dishes, which were a gloriously eclectic mix of textures and flavours. 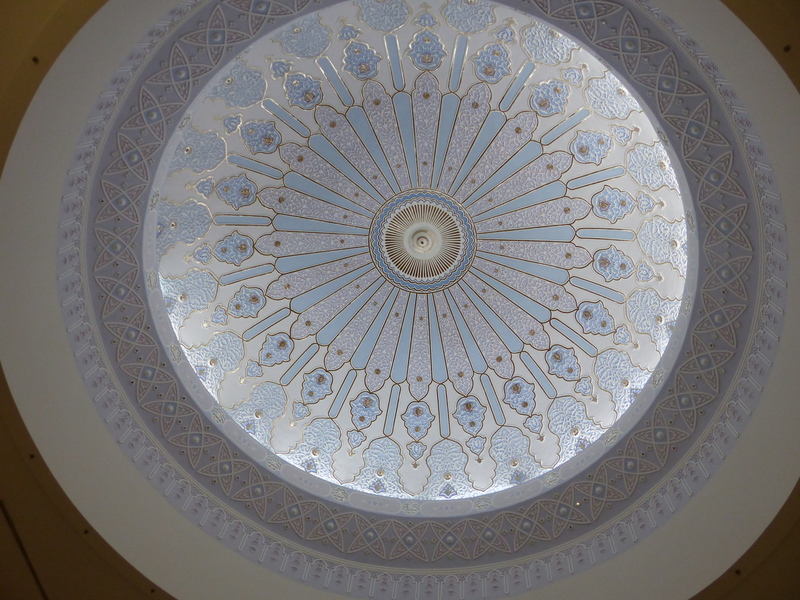 Having been massaged and fed, our gracious hosts, Sweeny and Jordan, took us to an Islamic Museum, which was super interesting. 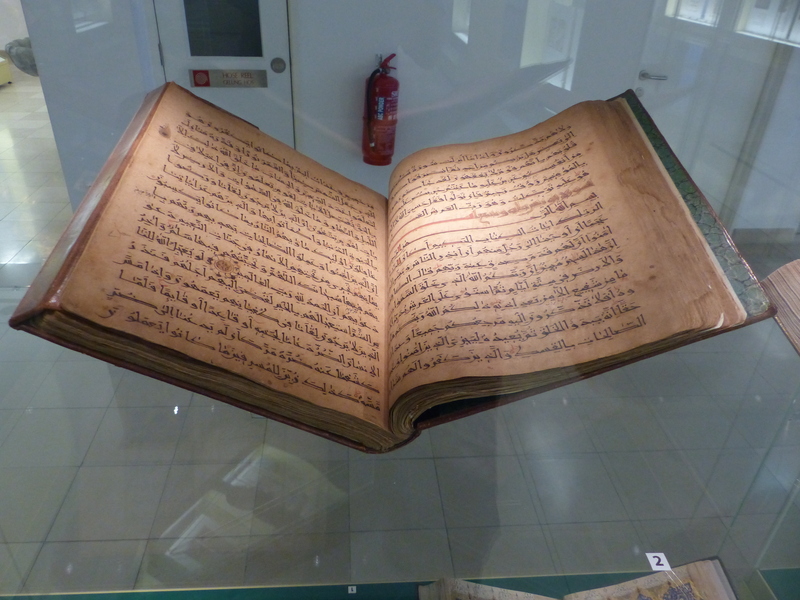 All the exhibits and items on display were Islamic and I was able to read and learn more about some of the history of that faith. 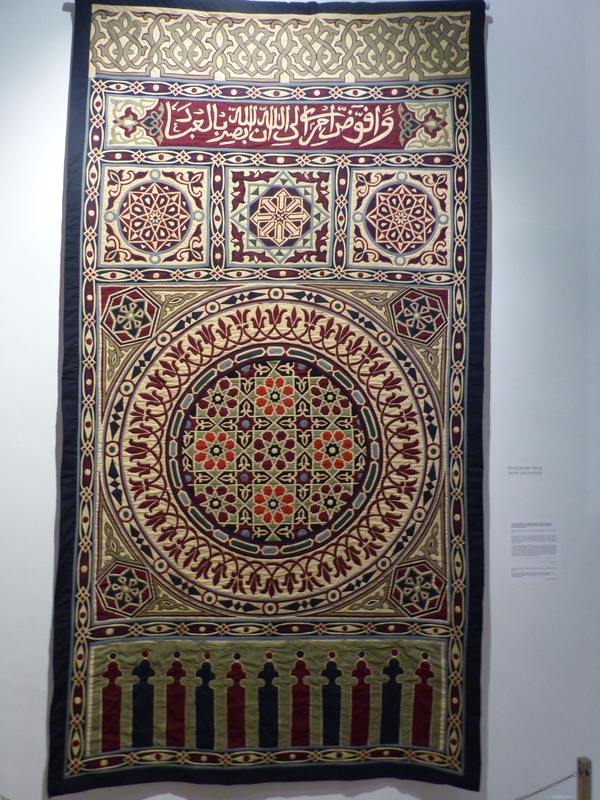 We saw some incredible, hand stitched mats and tent, some beautiful old Quran, some of which were in miniature and required a magnifying glass to see the text. 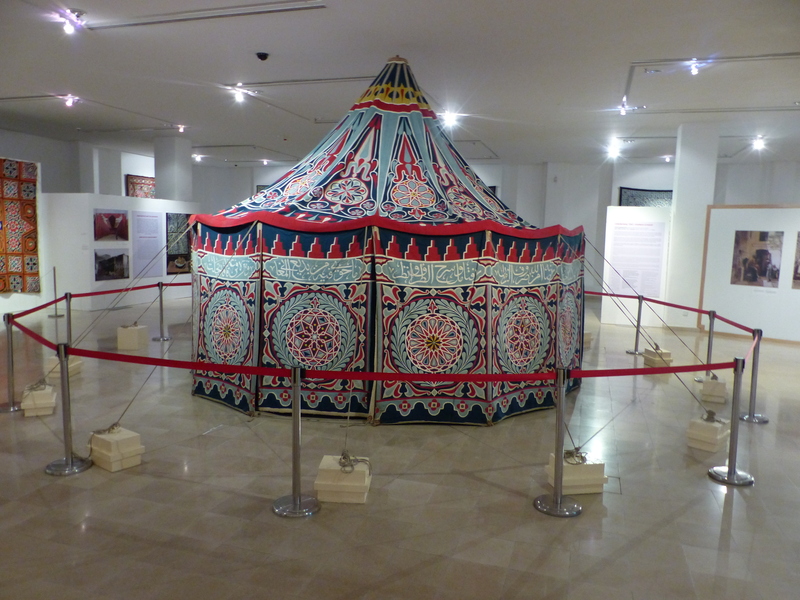 There were also displays of models of different mosques from around the world and it was great to just stroll through the halls, looking and reading about Islamic history. After a short rest stop back at the apartment, Sweeny then took us out for dinner and we had another delicious meal! What a top day! It was a hot one too! We’d come straight from the British winter and into 36C and near 100% humidity! It was lovely to sit out on the balcony of the apartment, in the slightly cooler evening air, looking across at the trees and taking in all that was around us, which added up to more amazing experiences. We are so lucky to have met the people we have and know the people we do and be blessed with the hospitality and warmth of wonderful people and Sweeny and Sasi, were two more such people. We met Sasi this morning, who had returned in the late hours from a business trip and then we all headed out for a traditional Malaysian breakfast. 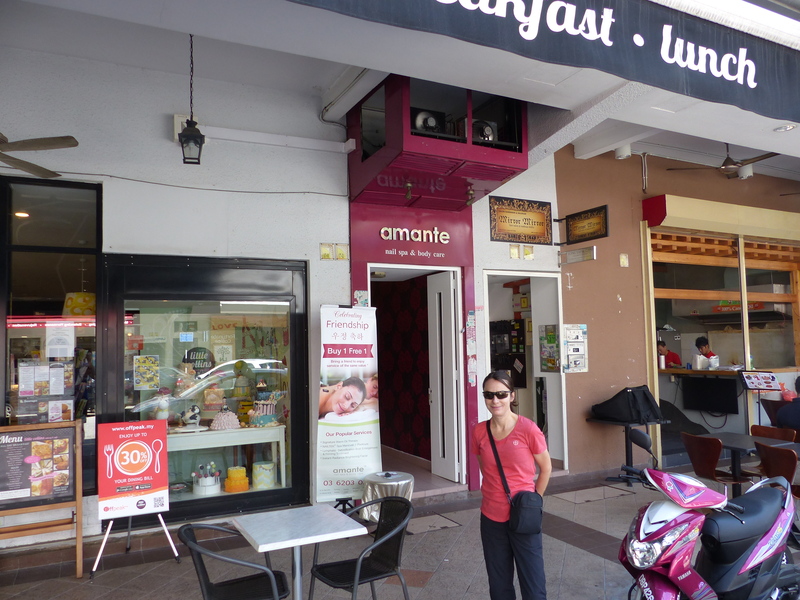 Sweeny and Sasi took us to another little cafe, where I enjoyed Nasi Lemak, a rice dish, with a spicy sauce and nuts. I thought it actually tasted quite sweet and it was very tasty. Steve had chapati with dahl (Indian flat bread, a little like a large pancake, with a lentil dipping sauce) and it was a delicious start to the day. 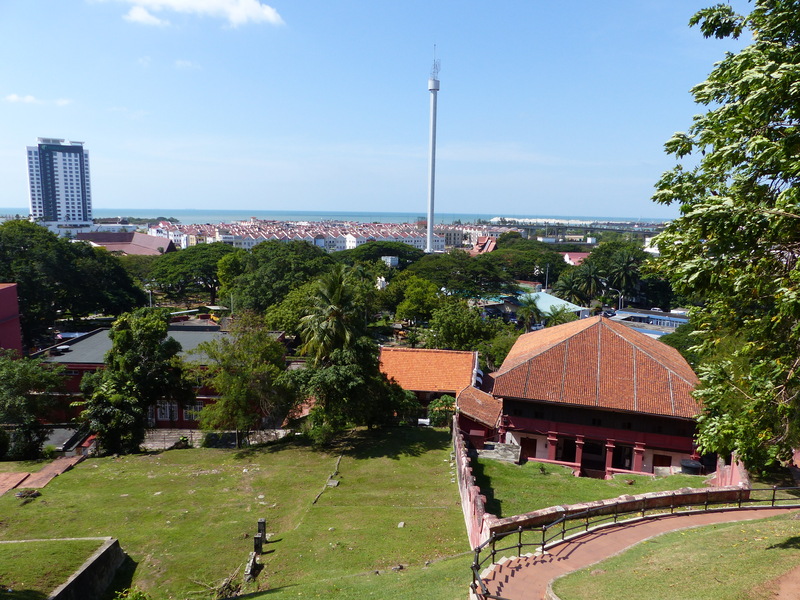 We hit the road, for the trip south, with our lovely hosts taking us to visit Melaka, a city that holds a rich history, being the site where Malaysia began. As we zoomed along in the car, I gazed again at the beautiful green scenery, with monkeys beside the highway and Sasi explained the situation in Malaysia with the palm plantations and the industries that the country relies on. 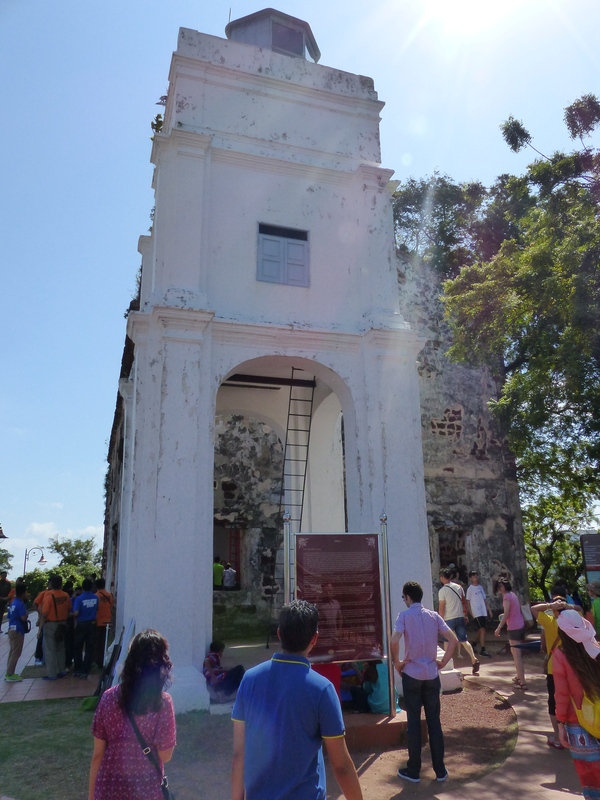 He also told us some fascinating stories about the origins and history of Malaysia and the state and city of Melaka. 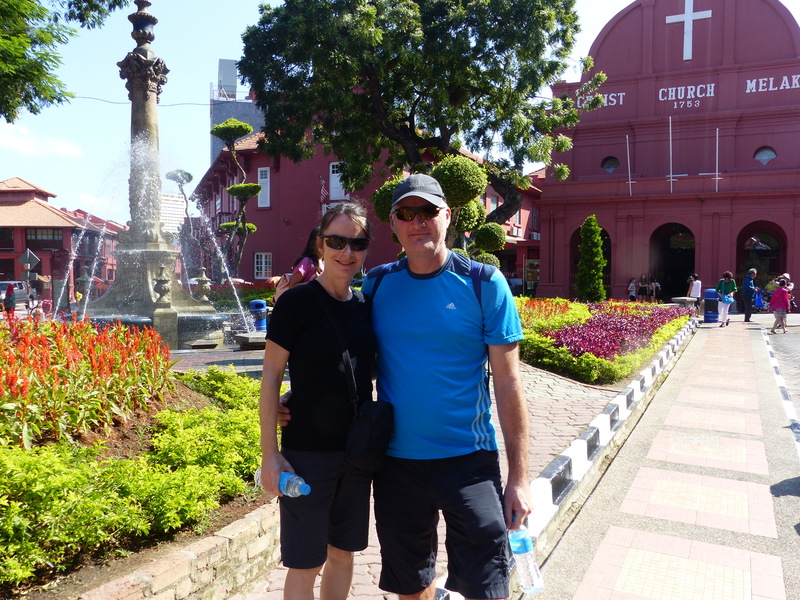 It was another scorcher and when we arrived, we strolled the streets in this lovely, historic place, with such a rich blend of architecture and cultures. 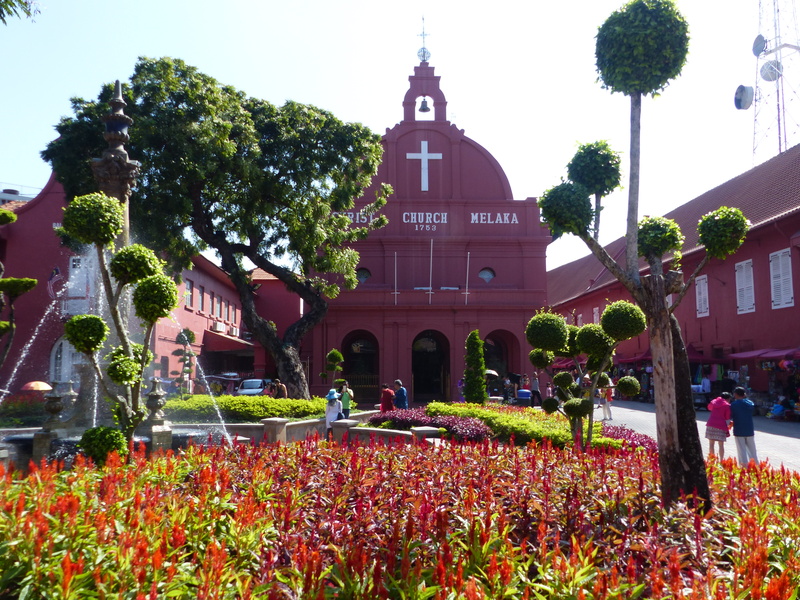 Melaka also has Portuguese, Dutch and British history, having been colonised by these people at various points in its history, but there was also that wonderful mix of Chinese, Indian and Malay, that we had seen elsewhere. 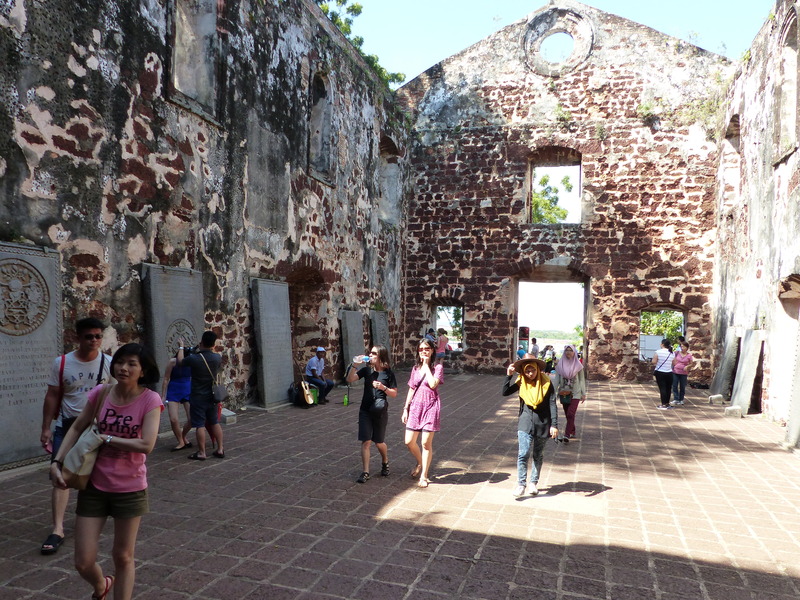 We visited St. Paul’s Church, which was built in 1521 by the Portuguese and is the oldest church building in Malaysia. 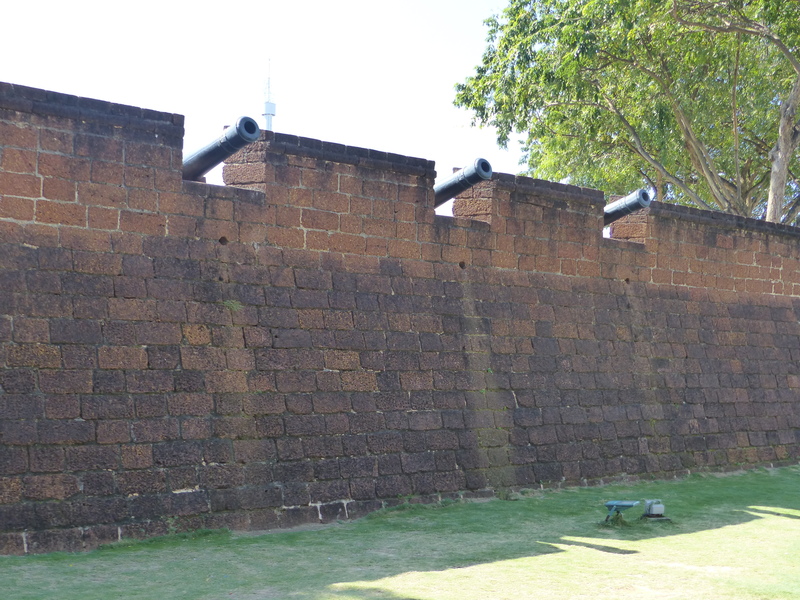 We saw the remains of the fort, parts of which are still standing from the time of the Portuguese and Dutch and then continued our stroll in that bright, blazing, scorching sun, through the bustling streets of Melaka. 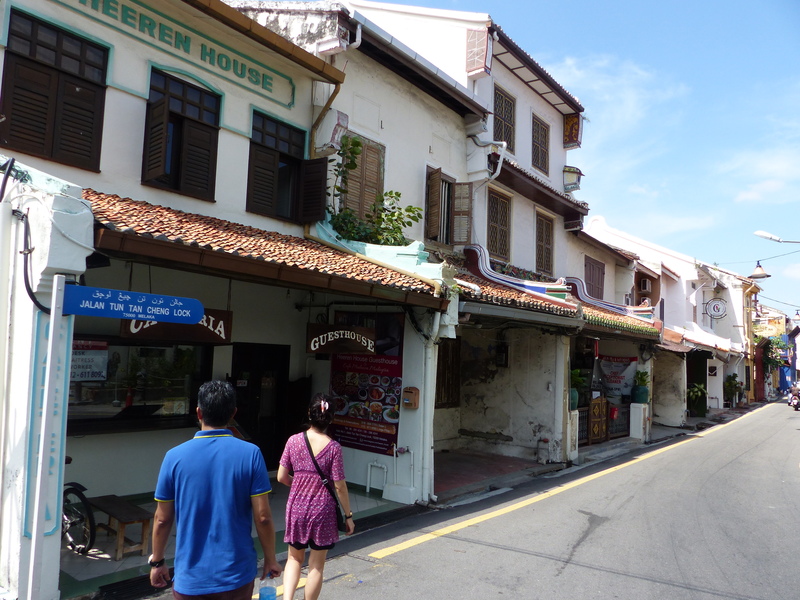 Sweeny and Sasi took us to the Baba & Nyonya Heritage Museum, which was home to the Perankan Family, before it was turned into a museum in 1985. Steve and I stayed for a tour and it was fascinating, with a very knowledgable and highly engaging guide, telling us about the history of the family, the uses for each room and the cultural practices of the family. 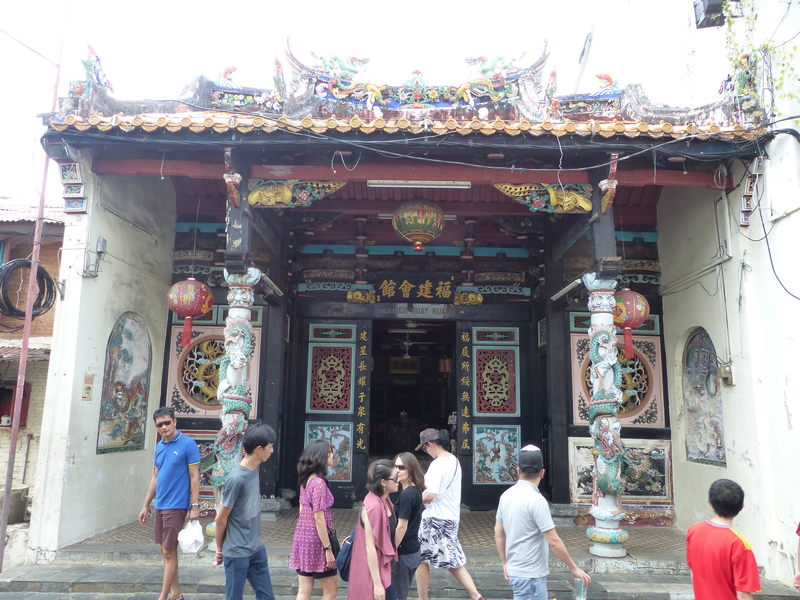 We weren’t able to take photos inside, but it was beautiful, with more influences from a range of countries and cultures. I loved seeing how the family lived, how their life changed over the four generations who lived in the house and seeing the beautiful interiors and decorations. Another memorable place to have seen. Sasi and Sweeny collected us and we were off for lunch to a restaurant, down a busy little street. Our meal of eggplant with chill, rice and mixed vegetables was another super delicious one and then Sweeny said we must try the local dessert. Mmmmmmm, that was so moreish! It was a little like a coconut milk sorbet, with shaved ice, a palm sugar syrup and beans. Yummo! We had been thoroughly fed and thoroughly spoiled! Sweeny and Sasi dropped us back at our hotel and we said our goodbyes to these wonderful, kind, gracious people who had welcomed us into their home and taken the time to share some of the remarkable sights and stories from their part of Malaysia. It was a wonderful visit.